These softsides feature the best materials and workmanship possible, we don't cut any corners, you get the best here: Truly waveless systems feature our premium Hydro-Support watermattresses with our Patented Complete Liner and Unconditional Guarantee, Heater with thermostat control, Full vinyl lining of the interior of the softside including the inside of the borders, Our exclusive K-Rail system with Polymer Band reinforcement for extra durability and long life. Our K-Rail has many advantages: It features dual firmness foam for comfort and durability. Polymer Band reinforcement system which gives in the sitting direction, but holds in the water pressure direction to prevent the rails from bowing out over time. The rails are fully wrapped in quality fabric. And since the watermattress fits into the inside of the K shape, you get a better sitting edge, and a better transition from watermattress to edge when laying on the bed. When sitting on the edge the watermattress is also supporting you since it fits inside the K shape, it does not roll out from under you and cause you to fall back into the bed like standard softside rails. And the same thing applies to laying on the bed. With standard softside rails when you roll to the edge of the bed the watermattress pulls away from the rail and you roll into a crevice between the watermattress and the rail. Not so with the K-Rail system, when you roll to the edge of the bed you barely notice the transition and the edge is comfortable. It is easier to get in and out of bed and you get a larger effective sleeping area. Our patented complete liner completely encases the inner watermattresses and forms a double wall mattress. If the inner watermattress ever develops a leak it will be completely contained by the clear outer watermattress. 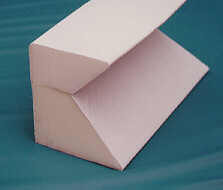 Conventional liners are not usually tall enough to contain the entire liquid contents if a leak should occur. Our complete liner gives you added security and peace of mind. 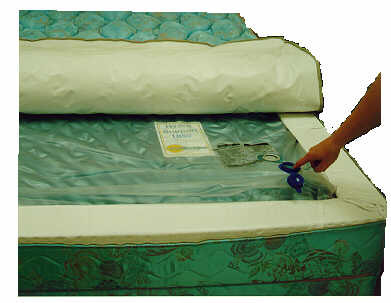 Additionally, we offer a complete guarantee on watermattresses with the complete liner option for the first five years. We even warrant against punctures. The double wall gives added strength. If a puncture should occur, from kids, dog chews, anything, we will take care of the mattress under warranty. You not only get better peace of mind, you get a better warranty than anyone else offers.